WEST FARGO – Weekly racing returned to Red River Valley Speedway Friday night. The evening was highlighted by the King Pin Klash IMCA Stock Car special, presented by The Bowler. 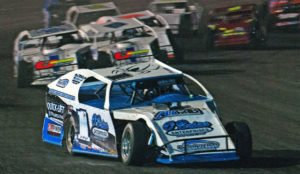 A season-high number of Stock Cars were in attendance for the higher payout. After picking up the opening night win of the two-night King Ping Klash Thursday night at Norman County Raceway in Ada, Minn., Brandon Schmidt of Hillsboro went back-to-back to sweep the event. Schmidt took the lead at the drop of the green flag. Kevin Mattox, who made the haul from Ray, N.D., near Minot, to compete in the King Pin Klash. He ran in the runner-up position in the early going, but Mattox’s night came to an end early after he suffered a flat right rear tire near the halfway point to bring out a caution. Schmidt held the point on the restart as Rob VanMil inherited the second spot. VanMil rode right in the tire tracks of Schmidt, but Schmidt was too strong. Schmidt went on to drive his No. 219 machine to a division-leading fourth win of the season as VanMil, who has three wins to his credit, settled for second. Brandon Schmidt of Hillsboro, N.D. cashed in at Red River Valley Speedway Friday after claiming the big IMCA Stock Car win. Dan Dowling of Davenport, who was fresh off a win Sunday at Buffalo River Race Park in Glyndon, Minn., picked up the IMCA SportMod win. Dowling took the point in the early going, but the race was quickly halted for a 10 car pile up in turn three. All drivers were able to rejoin the field for the restart with little to no damage. On the restart, Dowling opened up a comfortable lead. As Dowling approached lapped traffic, Chris VanMil closed the gap to become a contender. Dowling and VanMil traded the lead with under five laps remaining, but Dowling held on to take his first win of the season at the speedway. 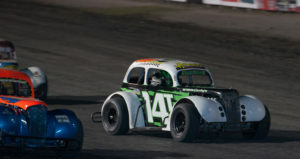 Tim Estenson cruised to yet another INEX legends feature win. The Fargo driver took the lead on lap three and never looked back. Sean Johnson remained within striking distance of Estenson, but Estenson went on to collect his 19th win of the season. 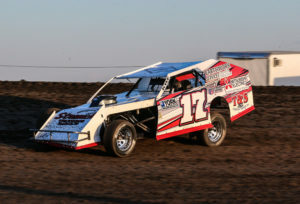 Jason Strand, who also picked up a win Thursday at Norman County Raceway, was looking to collect his second win in as many nights in the IMCA Modifieds. Strand appeared to be the class of the field through the first half of the 20-lap feature, but a string of cautions kept him at bay to the rest of the field. After holding off Rob VanMil, Strand had his hands full with Dale Kraling of Mayville. Strand’s race car pushed up the track in turn three, which allowed Kraling to take the lead. 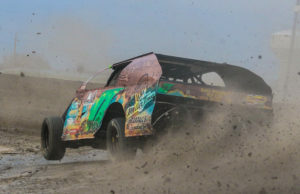 Strand was quickly challenged by Tyler Peterson for the second position, which gave Kraling an opportunity to pull away. Kraling went on to take the win over Peterson and Strand as Black Widow Chassis drivers swept the podium. Dale Kraling of Mayville, N.D. raced to his first win of the season Friday at Red River Valley Speedway in West Fargo. Nick Nelson of Georgetown, Minn. raced to his first IMCA hobby stock win of the season by a large margin over Tim Shiek. Feature 1: 1. 7-Dale Kraling, Mayville, N.D.; 2. 1TPO-Tyler Peterson, Hickson, N.D.; 3. 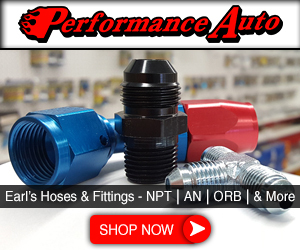 E85-Jason Strand, Portland, N.D.; 4. 6D-Dylan Goplen, Fargo, N.D.; 5. 84-Michael Johnson, Moorhead, Minn. Feature: 1. 2D-Dan Dowling, Davenport, N.D.; 2. 33-Brennan Urbach, Englevale, N.D.; 3. 5-Scott Jacobson, Fargo, N.D.; 4. 77-Charles Jensen, Pelican Rapids, Minn.; 5. 51-Kelly Jacobson, Fargo, N.D. Feature: 1. 219-Brandon Schmidt, Hillsboro, Minn.; 2. 40-Rob VanMil, Barnesville, Minn.; 3. 4-Rick Schulz, Horace, N.D.; 4. 99M-Kevin Mattox, Ray, N.D.; 5. 18-MIke Anderson, Walcott, N.D. Feature: 1. 14T-Tim Estenson, Fargo, N.D.; 2. 58-Sean Johnson, Kindred, N.D.; 3. 79-Scott Richardson, Pelican Rapids, Minn.; 4. 72-Tye Wilke, Detroit Lakes, Minn.; 5. 8JR-Kaitlyn Skalicky, Fargo, N.D. Feature: 1. 37N-Nick Nelson, Georgetown, Minn.; 2. 31X-Tim Shiek, Fargo, N.D.; 3. 3XL-Brad Orvedal, Fargo, N.D.; 4. 30A-Adam Goff, Minot, N.D.; 5. 14-Alyssa White, West Fargo, N.D.
WEST FARGO – The Buffalo Wild Wings NOSA Sprint Cars made their first and only appearance of the season to Red River Valley Speedway on Sunday evening during the Red River Valley Fair. 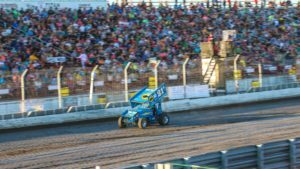 A crowd of over 5,000 race fans packed the grandstand to watch twenty-two 900+ horsepower sprint cars take on the high-banked three-eighths mile clay oval. Thomas Kennedy raced to his first career sprint car win at Red River Valley Speedway Sunday during the Red River Valley Fair. Thomas Kennedy of Winnipeg, Manitoba claimed his first career sprint car win at Red River Valley Speedway. Kennedy, who finished second on Saturday night at Devils Lake Speedway after leading every lap but the last one, started the night by winning his heat race in convincing fashion. Kennedy’s fastest lap during his heat was just four-one-hundredths of a second off the Red River Valley Speedway track record, which was set by World of Outlaws driver Shane Stewart last August. 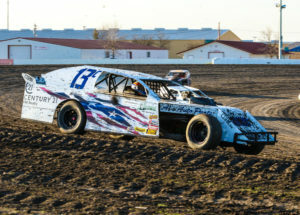 Kennedy’s lap time of 11.996 seconds put him at an average speed of 112mph and was just the fourth sub-12 second lap ever turned on Red River Valley Speedway’s three-eighths mile configuration. The 25-lap sprint car feature started with Jordan Graham taking the early lead over defending race winner, Wade Nygaard. Nygaard, a nine-time NOSA champion, took the lead on lap six as Kennedy followed him into second. The NOSA Sprints give their traditional four-wide salute to the fans before their main event at Red River Valley Speedway Sunday. On lap nine, Kennedy made a bold move to the inside of Nygaard to take the lead out of turn four in lapped traffic. Lurking in the third spot was the all-time NOSA wins leader, Mark Dobmeier. Dobmeier went after Nygaard for second, which allowed Kennedy to pull away. Dobmeier took the spot and began reeling in Kennedy in the closing laps. With two laps to go, Kennedy and Dobmeier found themselves in heavy lapped traffic. Dobmeier drove to the inside of turn four, where he clipped an infield tire barrier, which sent his Buffalo Wild Wings No. 13 upside down. A lapped car was also collected and got upside down with Dobmeier, but both drivers were ok.
On the ensuing restart, Kennedy got a great start and drove away from Nygaard. Kennedy drove the final laps unchallenged as he cruised to the $1,200 win. “I was racing on seven cylinders the whole race so this win feels even better,” said an elated Kennedy in victory lane. 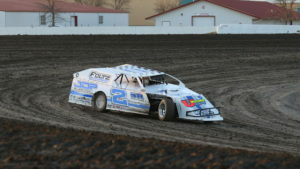 Michael Johnson of Moorhead, Minn. picked up his first IMCA modified win of the season. Johnson led the majority of the 25-lap feature to pick up the win over Dylan Goplen, who ran a close second. The best racing on the track was back in the pack as several drivers came from deep in the field to move into the top five. Cale Arneson rounded out the podium, while Jason Strand, who started 15th, finished fourth. Casey Arneson started 13th to finish fifth, while Dale Kraling was the hard charger of the event coming from 19th to finish sixth. Tim Estenson came from the 15th starting position to win the INEX Legends feature. Estenson held off pole sitter, Sean Johnson, for his 16th win of the season overall. Next week at Red River Valley Speedway, Rusty Wallace will be in attendance as the grand marshall of the event. Feature: 1. 21K-Thomas Kennedy, Winnipeg, MB; 2. 9N-Wade Nygaard, Grand Forks, N.D.; 3. 8H-Jade Hastings, Grand Forks, N.D.; 4. 2A-Austin Pierce, Grand Forks, N.D.; 5. 4J-Lee Grosz, Harwood, N.D. Feature: 1. 84-Michael Johnson, Moorhead, Minn.; 2. 6D-Dylan Goplen, Fargo, N.D.; 3. 99-Cale Arneson, Fargo, N.D.; 4. E85-Jason Strand, Portland, N.D.; 5. 2-Casey Arneson, Fargo, N.D. Feature: 1. 14T-Tim Estenson, Fargo, N.D.; 2. 58-Sean Johnson, Kindred, N.D.; 3. 5D8-Dylan Johnson, Durbin, N.D.; 4. 79-Scott Richardson, Pelican Rapids, Minn.; 5. 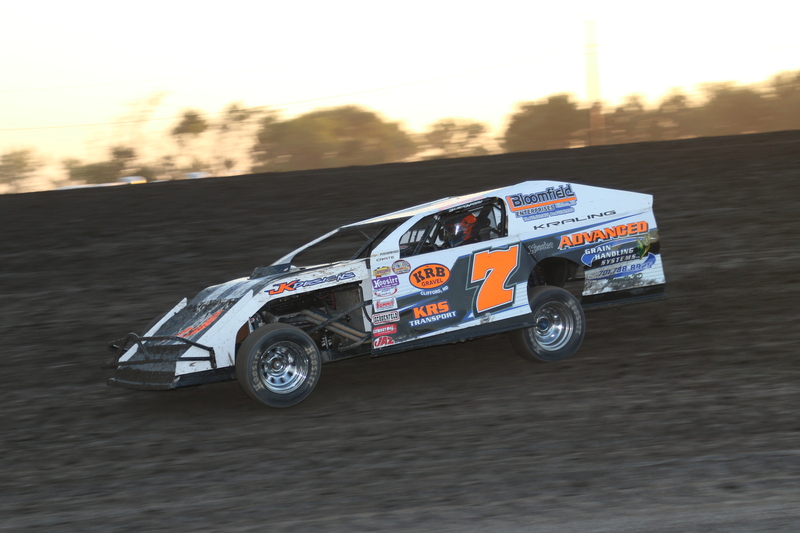 72-Tye Wilke, Detroit Lakes, Minn.
WEST FARGO – Tyler Peterson of Hickson collected his second IMCA Modified win of the season at the West Fargo dirt track after starting in the ninth position. Dylan Goplen and Rob VanMil led the pack early on, but while racing for the lead, VanMil slid into Goplen which forced them both to spin. The caution was called on VanMil, while Goplen reclaimed his spot back in the lead for the ensuing restart. Photo: Tyler Peterson raced to his second IMCA Modified win of the season Friday at Red River Valley Speedway in West Fargo. As the race went green, a four-car battle for the point broke out between Goplen, Casey Arneson, Dave Shipley, and Peterson. Arneson won the fight to take the lead. At the halfway point, Michael Greseth and Peterson caught Arneson. Peterson took the lead as a caution reset the field on the following lap. Cautions plagued the second half of the race, but in the closing stages, Greseth and Arneson mounted one last charge on Peterson. With three to go, the lead trio went three wide for the lead, but Greseth suffered a push in turn one, which allowed Peterson to maintain the lead and Arneson to gain second. Peterson fended off Arneson on the final lap to claim the win. 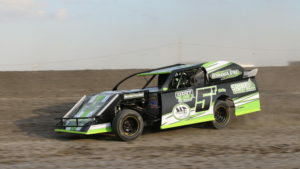 Kelly Jacobson of Fargo picked up his second IMCA SportMod win of the week. Jacobson, who won Thursday night at Norman County Raceway in Ada, Minn., charged into the lead on lap two with a three-wide pass over Charlie Jensen and Torey Fischer. A few cautions throughout the race kept Jacobson at bay to the rest of the field. With eight laps remaining, Matt Talley began closing in on Jacobson for the lead. Jacobson was able to hold on to claim his first Red River Valley Speedway win of 2018 over Talley and 10th place starter, Chris VanMil. One of the biggest fields of IMCA stock cars of the season was on hand. It took two attempts at a complete restart to get the race underway, but once it did, Larry Niemi took the lead while a four-wide battle for second broke out behind him. Brandon Schmidt, who also won at Norman County Raceway earlier this week, and Rob VanMil raced for second before getting by Niemi to make it a fight for the lead. Schmidt and VanMil traded the spot back and forth for the remainder of the event. VanMil got a good run on Schmidt into turn three on the final lap, but Schmidt held on for his second consecutive Red River Valley Speedway win. In just his second start of the season at Red River Valley Speedway, Andrew Jochim of Glyndon, Minn. picked up the INEX legends feature win. Jochim and fellow fifth-row starter, Tim Estenson, sliced their way through the field to find the front with five laps to go. Jochim and Estenson raced three wide for the top spot with Tye Wilke into turn three. Jochim emerged as the leader with Estenson in tow. 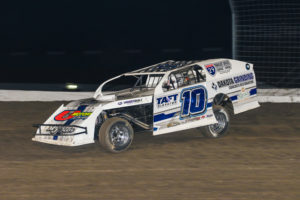 Estenson, who was in search of his 11th overall win of the season, used every inch of the three-eighths-mile clay oval trying to find a way around Jochim but came up short at the checkers. Adam Goff of Minot has three starts at Red River Valley Speedway thus far in 2018. 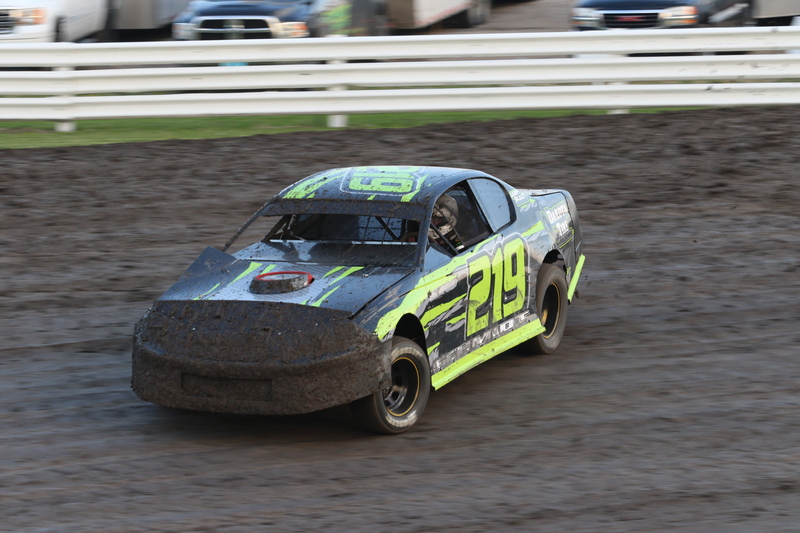 By night’s end, he would leave West Fargo with his second IMCA Hobby Stock victory. Goff, Tim Shiek, and Eric Novacek went three wide for the lead early on before Goff claimed the point. Once out front, Goff checked out as he cruised to the win. Feature – 1. 1TPO-Tyler Peterson, Hickson, N.D., 2. 2-Casey Arneson, Fargo, N.D., 3. 17-Michael Greseth, Harwood, N.D., 4. 99-Cale Arneson, Fargo, N.D, 5. 72-Dave Shipley, Argusville, N.D. Feature – 1. 51-Kelly Jacobson, Fargo, N.D., 2. 5T-Matt Talley, Sabin , Minn, 3. 40-Chris VanMil, Barnesville, Minn., 4. 8J-Luke Johnson, Moorhead, Minn., 5. 6-Austin Veralrud, Fargo, N.D. Feature – 1. 219-Brandon Schmidt, Hillsboro, Minn., 2. 40-Rob VanMil, Barnesville, Minn., 3. 18-Mike Anderson, Walcott, N.D., 4. 4-Rick Schulz, Horace, N.D., 5. 14-Nick Johansen, Tyler, Minn. Feature – 1. 21-Andrew Jochim, Glyndon, Minn., 2. 14T-Tim Estenson, Fargo, N.D., 3. 72-Tye Wilke, Detroit Lakes, Minn., 4. 8JR-Kaitlyn Skalicky, Fargo, N.D., 5. 5D8-Dylan Johnson, Durbin, N.D. Feature – 1. 30A – Adam Goff, Minot, N.D., 2. 31X-Tim Shiek, Fargo, N.D., 3. 3XL-Brad Orvedal, Fargo, N.D., 4. 14-Alyssa White, Ontonagon, M.I., 5. 106-Eric Novacek, West Fargo, N.D.
WEST FARGO, N.D. — June 18, 2018 — Tickets are now on sale for the “Duel in the Dakotas” on Saturday, August 18 at Red River Valley Speedway in West Fargo, North Dakota, featuring the World of Outlaws Craftsman Sprint Car Series. Tickets can be purchased online at slspromotions.ticketforce.com or by calling SLS Promotions at 815-344-2023. Jason Johnson won at Red River Valley Speedway last season in his debut at the track as the World of Outlaws Craftsman Sprint Car Series returned to the three-eighths-mile for the first time since 2012. Kerry Madsen finished second with Shane Stewart in third. 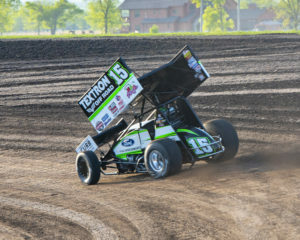 Donny Schatz, who now calls Fargo home, has won four times at Red River Valley Speedway with the World of Outlaws Craftsman Sprint Car Series, including winning both nights of the 2006 “Duel in the Dakotas.” The nine-time series champion raced with the Outlaws for the first time at Red River Valley Speedway as a teenager in 1993. Battling Schatz and Johnson this season is a talented group of full-time competitors, including 2013 series champion Daryn Pittman, Brad Sweet, who is Pittman’s teammate at Kasey Kahne Racing, David Gravel, who won a career-high 18 races last year, Shane Stewart, Sheldon Haudenschild, who is having a breakout year with four wins thus far in 2018, as well as veteran drivers Kraig Kinser, Jason Sides and Greg Wilson. Young drivers Logan Schuchart, Jacob Allen and Clyde Knipp are all back on the road again in 2017, along with sophomore driver Brent Marks, who recently won his first career World of Outlaws Craftsman Sprint Car Series race at Wilmot Raceway in Wisconsin. Ian Madsen is the leading contender for the Kevin Gobrecht Rookie of the Year Award in 2018. 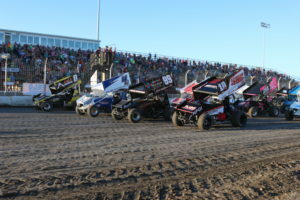 Tickets for the “Duel in the Dakotas,” featuring World of Outlaws Sprint Car Series event at Red River Valley Speedway in West Fargo, North Dakota, on Saturday, August 18 can be purchased online at slspromotions.ticketforce.com or by phone at 815-344-2023. 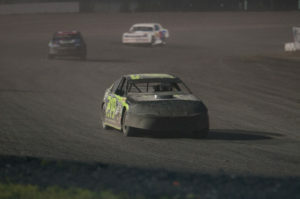 WEST FARGO—A late afternoon storm made for tricky track conditions and a wild and unpredictable night of racing Friday at Red River Valley Speedway. During the IMCA stock car feature last week, Rick Schulz of Horace made contact with another car, which sent him into the wall and barrel rolling on the front straightaway. A week later, he was standing in victory lane. Schulz jumped out to the early lead from the third starting position. The driver of the Sanders Metal Products No. 4S led every lap en route to his first win of the season at Red River Valley Speedway and second overall. 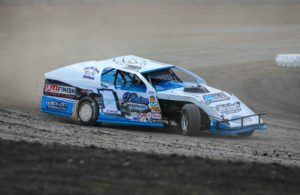 Rick Schulz rolled his IMCA stock car last week, but picked up the feature win Friday at Red River Valley Speedway in West Fargo. Schulz was followed to the line by Thursday night’s winner at Norman County Raceway, Rob VanMil. The first of three first-time winners at the high-banked three-eighths-mile clay oval was Tim Thomas of Fargo. Thomas won the make-up IMCA modified feature that was rained out last Friday. Thomas led every circuit of the 15-lap event to claim his first career IMCA modified win. Tim Thomas raced to his first career IMCA modified feature win Friday at Red River Valley Speedway in West Fargo. West Fargo’s Matt Clark also picked up his first career win. Clark, who is amidst his sophomore season in the IMCA SportMods, claimed the win after dominating the majority of the 16-lap feature. Clark nearly had a half-lap lead over Brennan Urbach in second at the halfway point, but the caution was displayed as Clark was about to take the checkers. As a result, a two-lap dash to the finish ensued, but Clark’s car stalled while under caution. Clark momentarily pulled into the infield, but he was able to get his machine refired to rejoin the field. Urbach challenged Clark on the restart, but Clark had the momentum on the high side of the race track. Clark cruised to the win over Urbach, Luke Johnson, who started 11th, while Kelly Jacobson and Scott Jacobson rounded out the top five. The INEX legends feature came down to the last corner of the last lap before the winner was determined. Dylan Johnson of Dubin held until the final circuit when Scotty Richardson momentarily took the lead in the field set of corners. Richardson slid up the track to take the lead, but Johnson kept his foot on the throttle and pulled even with Richardson as the duo came to the checkered flag. They made contact at the flagstand as Johnson was declared the winner by a mere 0.019 seconds, equating about 10 inches. 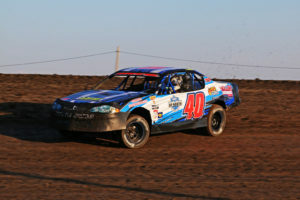 Tim Shiek scored his fourth IMCA hobby stock win in a row at Red River Valley Speedway in dominating fashion. The win marked his sixth overall in the last eight races. 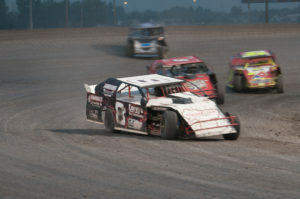 WEST FARGO – Round three of weekly racing at Red River Valley Speedway continued Friday night. 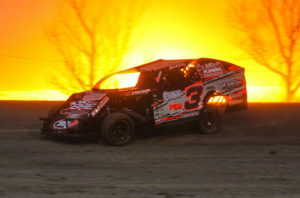 The evening was highlighted by the Dakota Cat Modified Shootout, which brought in 21 IMCA Modifieds. Michael Greseth led wire to wire Thursday night at Norman County Raceway to win night one of the Dakota Cat Modified Shootout. Friday’s edition saw much of the same. Greseth started third on the grid but raced past Jesse Skalicky and Brady Petermann on lap two to take the lead. Once out front, the Harwood driver set sail. Greseth cruised out to nearly a four-second lead. Greseth dominated the 25-lap event to collect his third consecutive win as Tyler Peterson, Austin Arneson, Cale Arneson, and Dave Shipley rounded out the top five. Dan Dowling claimed his first IMCA Sport Mod win of 2018. Dowling grabbed the early lead, but he quickly had his hands full with Scott Jacobson. Jacobson grabbed the lead on lap three, but the caution was soon to follow. On the ensuing restart, Dowling regained the lead. In the closing laps, the race for the lead became a four car battle. Dowling, Jacobson, his son, Kelly Jacobson, along with Luke Johnson were all in contention for the win as the white flag flew, but Dowling was able to hold on for the win. Johnson, who started 12th, edged out Kelly Jacobson, Scott Jacobson, and 16th place starter, Austin Veralrud. 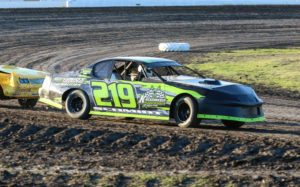 After a successful season in the IMCA hobby stocks last year, Hillsboro driver Brandon Schmidt moved up to the IMCA stock cars for the 2018 season. Poised to claim his first stock car win, Schmidt started on the outside of the front row and grabbed the lead on the opening circuit. Schmidt wasted no time distancing himself from the rest of the pack. Schmidt went on to score the win by a second and a half over Tim Compson and Rick Schulz. Coming off a 20-plus win season last year, INEX legends driver Tim Estenson returned to his winning ways. Estenson, who was coming off a feature win at Buffalo River Race Park, started fifth on the field and took the lead on lap one. 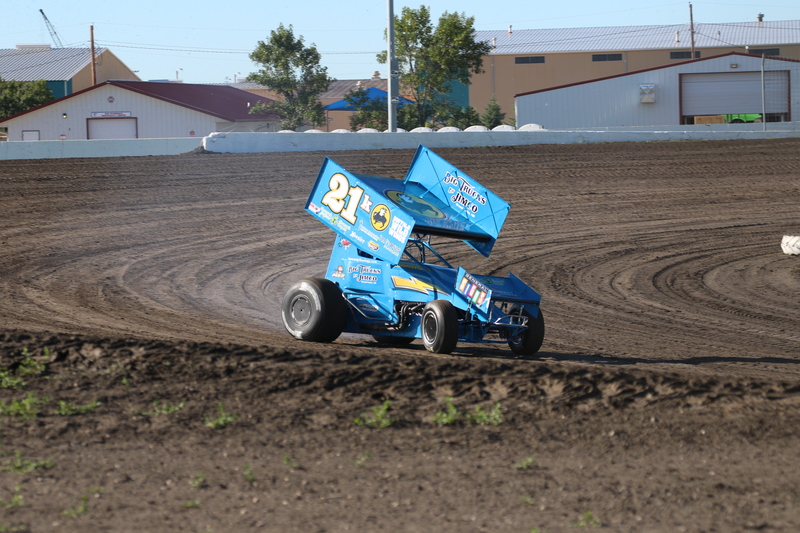 Estenson withstood a challenge from Sean Johnson to pick up his second win of the season at Red River Valley Speedway and third overall. Tim Shiek of Fargo raced his way to the IMCA hobby stock feature win. Shiek outraced Brad Orvedahl in the first handful of laps around the high-banked three-eighths-mile clay oval to take the point. Maranda Borg challenged Shiek in the final stages, but Shiek was able to hold on for the victory. Racing continues next Friday night with the green flag dropping at 7 pm. Feature: 1. 17G-Michael Greseth, Harwood, N.D.; 2. 1TPO-Tyler Peterson, Hickson, N.D.; 3. 10-Austin Arneson, Fargo, N.D.; 4. 99-Cale Arneson, Fargo, N.D.; 5. 72-Dave Shipley, Fargo, N.D. Feature: 1. 2D-Dan Dowling, Davenport, N.D.; 2. 8J-Luke Johnson, Moorhead, Minn.; 3. 51-Kelly Jacobson, Fargo, N.D.; 4. 5-Scott Jacobson, Fargo, N.D.; 5. 6-Austin Veralrud, Fargo, N.D. Feature: 1. 219-Brandon Schmidt, Hillsboro, N.D.; 2. 49-Tim Compson, Valley City, N.D.; 3. 4-Rick Schulz, Horace, N.D.; 4. 40-Rob VanMil, Barnesville, Minn.; 5. 18-MIke Anderson, West Fargo, N.D. Feature: 1. 14T-Tim Estenson, Fargo, N.D.; 2. 58-Sean Johnson, Kindred, N.D.; 3. B1-Brody Carlsrud, Moorhead, Minn.; 4. 79-Scott Richardson, Pelican Rapids, Minn.; 5. 72-Tye Wilke, Detroit Lakes, Minn. Feature: 1. 31X-Tim Shiek, Fargo, N.D.; 2. 73-Maranda Borg, Harwood, N.D.; 3. 3XL-Brad Orvedal, Fargo, N.D.; 4. 106-Eric Novacek, West Fargo, N.D.; 5. 701-Kyle Hallgren, Hankinson, N.D.
WEST FARGO—Weekly dirt track racing continued at Red River Valley Speedway at the Red River Valley Fairground Friday night. Eighty-three race teams were checked in for action. The night featured the Fargo Force WISSOTA Super Stock Series for the first of four times in 2018. In the first feature of the night, the IMCA stock cars put on a show throughout their 15-lap feature. Defending stock car track champion, Rob VanMil, battled all race long with stock car rookie, Brandon Schmidt. VanMil took the lead on lap five from the fifth starting position but relinquished the lead to Schmidt with three laps to go. The two drivers raced door to door for the remainder of the event, swapping the lead on both ends of the three-eighths-mile clay oval. Schmidt had the advantage on the final lap, but VanMil got a strong run down the banking exiting turn two to pull even with Schmidt. VanMil completed the pass coming out of the final set of turns coming to the checkered flag to steal the win by 0.176 seconds. Schmidt and Tim Compson rounded out the podium. After several attempts to get the first lap of the IMCA Sport Mod feature completed, Kelly Henderson of Minot, N.D., took the point. He was trailed by Matt Talley of Sabin, Minn, who kept within striking distance throughout the midpoint of the race. With two laps to go, Talley moved by Henderson to take the lead. Henderson battled back on the final circuit and nearly reclaimed the lead. Talley’s car pushed up the track in turns three and four, which opened the door for Talley. It came down to a drag race to the checkers, where Talley hung on by a mere 0.069 seconds, equating to about two feet. The INEX legends feature was the third feature of the evening and produced another late-race pass for the lead. Tim Estenson led the 16-car field on the final restart with under five laps to go. Estenson pulled away as the race resumed, but second place runner Sean Johnson quickly caught the leader. With two laps to go, Johnson executed a slide job on Estenson to take the lead. Estenson powered back by on the final circuit to reclaim the point, but Johnson wasn’t done. Johnson drove his machine hard into turns three and four, pulled even with Estenson, but spun out coming to the checkers. Estenson held on to take the win as Tye Wilke and Kaitlyn Skalicky rounded out the top three. On last week’s opener, Austin Arneson cruised to the IMCA modified win. On Friday, it was his brother Casey who parked it in victory lane. Arneson led all 20 circuits en route to the win. He was followed to the line by his other brother, Cale Arneson, by a distant three and ½ seconds. Cole Searing claimed his first career Red River Valley Speedway win in the Fargo Force Super Stocks. The field was led to the green by Brian Bernotas, but Bernotas was quickly harassed by Searing and Jeff Crouse. Around the midway point, Searing moved up to the high side and closed in on Bernotas. Searing made the pass for the lead, and ultimately the win with seven laps to go. Maranda Borg took the lead in the early going of the IMCA hobby stock feature. Tim Shiek reeled in Borg around the halfway point and utilized a restart with five to go to take the lead. From there, Shiek cruised to the win over Borg and Brad Orvedal. Feature: 1. 40-Rob VanMil, Barnesville, Minn. 2. 219-Brandon Schmidt, Hillsboro, N.D. 3. 49-Tim Compson, Valley City, N.D. 4. 18-Mike Anderson, Walcott, N.D. 5. 4-Rick Schulz, Horace, N.D. Feature: 1. 31X-Tim Shiek, Fargo. 2. 73-Maranda Borg, Harwood, N.D. 3. 3XL-Brad Orvedal, Fargo. 4. 14-Alyssa White, West Fargo. 5. 106-Eric Novacek, West Fargo. Feature: 1. 14T-Tim Estenson, Fargo. 2. 72-Tye Wilke, Detroit Lakes, Minn. 3. 8JR-Kaitlyn Skalicky, Fargo. 4. 20-Alex Braseth, Ulen, Minn. 5. 69-Brian Hanson, Jamestown, N.D.
WEST FARGO – The 2018 dirt track racing season is officially underway. Nearly 2,000 race fans packed the Red River Valley Speedway Friday night for the opening night. The pit area was also packed with 83 race teams checked in among the five different divisions. The 2018 season will mark Paul Colvin’s third year behind the wheel of an IMCA Sport Mod. So far, it’s off to a great start. The Horace driver picked up his first career Sport Mod win over a stacked field of 21 other competitors. Colvin, who started third, battled his way past front row starters Chris VanMil and Dan Evert to take the lead in the early going. A series of cautions put Brennan Urbach, who was competing in his first ever Sport Mod race, right on the rear bumper of Colvin. Late in the going, 12th place starter Billy Michaelsohn put the pressure on Colvin around the fast and tacky three-eighths-mile dirt oval. Colvin held a steady line in the middle groove of the track to take the win. For the second year in a row, Austin Arneson won the IMCA Modified opener at Red River Valley Speedway. Arneson, who recorded five wins at the West Fargo track in 2017, cruised to the win with little challenge. Lucas Rodin hung with Arneson in the opening laps, but the Fargo driver pulled away from Rodin and the rest of the field as the race advanced. The best action was back in the pack as Michael Greseth and Dave Shipley put on a show as they sliced through the field. Greseth, who started 12th, and Shipley, who started 24th, both came away with top-five finishes, finishing behind Dale Kraling in fourth and fifth, respectively. 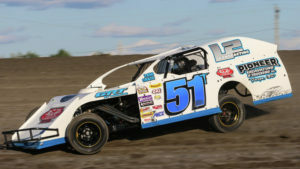 Two-time IMCA stock car winner last year, Rob VanMil of Barnesville, picked up where he left off last year. VanMil scored a highly contested feature win over Rick Schulz. The two veteran drivers battled door to door for several consecutive laps, with stock car rookie Brandon Schmidt in the mix. VanMil took the point over Schulz in the closing laps and held on by one car length to collect the win. Pelican Rapids driver, Scotty Richardson, claimed one of the most exciting wins of the night in the INEX Legends. Richardson started on the pole en route to the victory but had his hands full with Tim Estenson and Sean Johnson. Estenson threatened to take the lead away with three laps to go as he executed a slide job in turn one. Richardson, being the veteran driver he is, countered with a crossover move underneath Estenson exiting turn two. The following lap, Estenson, and Richardson continued their battle, but they were both surpassed by Johnson, who got a big run down the embankment out of turn two. Johnson momentarily took the lead, but the caution soon followed as Estenson spun in front of the field and collected three other drivers. All drivers were ok and able to rejoin the field. On the restart, Richardson took the lead from Johnson and went on to score the win. Andrew Jochim, who started 12th, finished third, while Chad Sogge and 15th place starter Tye Wilke rounded out the top five. Adam Goff held off Red River Valley Speedway regular Tim Shiek to record the IMCA hobby stock victory. Shiek gave Goff a run for his money, but the Minot driver held off Shiek to the checkers. Racing continues next Friday at Red River Valley Speedway. 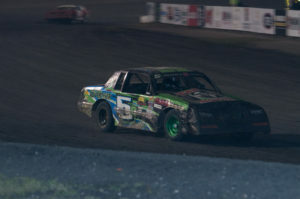 Along with the other weekly divisions, the Fargo Force Wissota Super Stocks will make their first appearance of the season at the track. The green flag drops at 7:00 pm. WEST FARGO – Similar to the opening day of baseball, there is something nostalgic about the season openers at the F-M area dirt tracks. Nearly a half-century of racing history is entrenched into the tracks’ rich, black, Red River Valley soil. 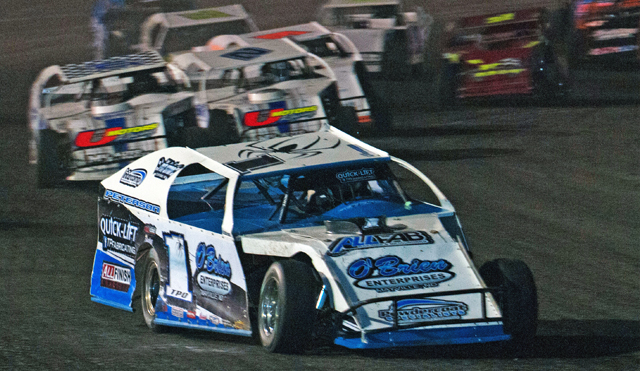 From the primitive stock cars that kicked up dust in the 1960s to the highly modified, high-performance machines that torch the tracks today, local auto racing has evolved into a very skilled and competitive sport. 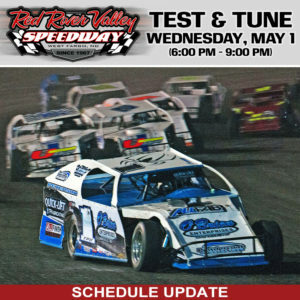 On Friday, Red River Valley Speedway (RRVS) will host its 48th season opener. The rumble of a 700 horsepower engine, the intoxicating smells of the high-octane race fuel and the feeling of anticipation and excitement as another season of racing approaches; that’s what it’s all about says Nick Skalicky, COO of RRVS. 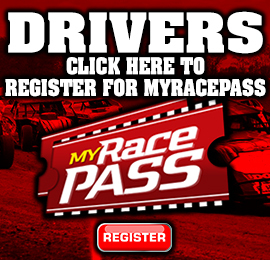 RRVS will be the only track in North Dakota hosting its opener this weekend besides Nodak Speedway in Minot. The late spring and cool temperatures in April have forced other tracks to postpone, but the crew at RRVS has worked hard to get the track up and running for Friday’s scheduled opener. The track held a pre-season practice session Wednesday night so drivers could fine-tune their cars before Friday. The laps on the track also helped the racing surface get packed in after sitting dormant during the offseason. 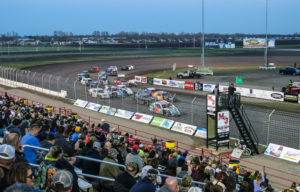 A large field of over 70 race teams took advantage of the midweek practice night, indicating that car counts in all divisions at the speedway should be just as good, if not better, than last year. Entering their third year managing the track, Skalicky along with Jake and Sharnel Bitker, have put a focus on the family aspect for fans this year. The track is now offering a family pack that includes two adult tickets, two kid tickets, two free “Attraction” passes to Thunder Road, and a certificate for a free “Shareable” meal at Buffalo Wild Wings all for $30. The Bitkers and Skalicky know that it’s important to get the young ones home at a decent time at the end of the night, so they work hard to put on an efficient two-and-a-half to three-hour show to be done no later than 10:00 pm. Bike giveaways and meet and greets with the drivers throughout the season, and a candy toss during intermission each night all highlight the kid-friendly atmosphere at the track. RRVS is bringing back its stout lineup of weekly racing again in 2018 that includes IMCA Modifieds, Sport Mods, Stock Cars, Hobby Stocks and INEX Legends. 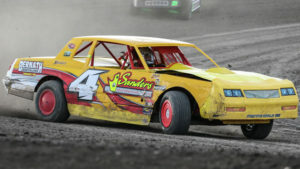 The track’s premier division, the IMCA Modifieds, usually has the toughest competition with the largest car counts each week. Last year, Fargo’s Dave Shipley, driver of the no. 72 IMCA modified, captured his first career track championship at RRVS after competing at the speedway for the last 17 years. Shipley says he’s looking forward to getting back behind the wheel Friday to defend his title. While their three-year lease is up at the end of the 2018 season, Skalicky and the Bitkers are looking to expand upon what they’ve built at RRVS and have already locked in dates for the 2019, 2020 and 2021 racing season. May 25: Dakota Cat Modified Shootout – Working in conjunction with Norman County Raceway (NCR) in Ada, Minn., the Dakota Cat Modified Shootout will be a two-night special for the IMCA Modifieds. 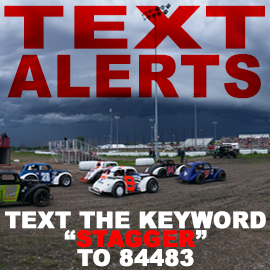 July 15: Sprint Car Special – Auto racing will cap off grandstand entertainment at the Red River Valley Fair for the third consecutive year, featuring the Buffalo Wild Wings NOSA Sprint Cars, IMCA Modifieds and INEX Legends. July 20: Rusty Wallace Night – Former NASCAR Cup champion, Rusty Wallace, will make an appearance at the speedway. Fans will have an opportunity to interact with Wallace during a meet and greet at the races. 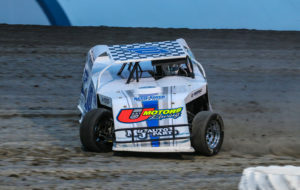 August 8: Sanders Metal Products Modified Challenge – The sixth edition of this IMCA modified special will begin on Wednesday night at RRVS, before wrapping up the following evening at NCR. 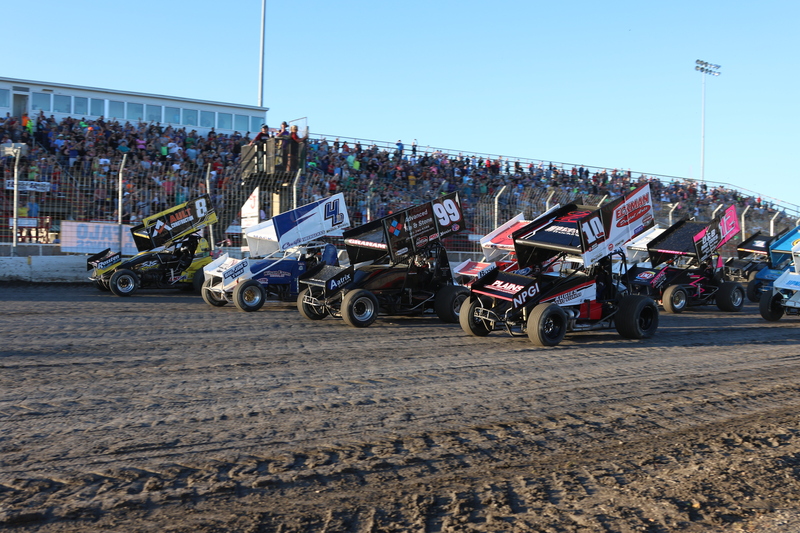 August 18: World of Outlaws Sprint Cars – The vastly popular Outlaws will return to RRVS for the second consecutive year and 32nd time overall. A crowd of over 6,500 witnessed the Outlaw show last year.